Whether it's using special wood or metal bracing, foam or vacuum crate packing; you'll receive reliable and efficient on-site packing services. Typical turnaround time is within 48 hours, in some cases, less. 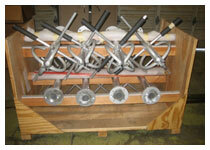 And, when arranged ahead of time, we'll work late nights or even weekends to help ready your product for shipment. it's part of our commitment of providing you dependable and flexible service. 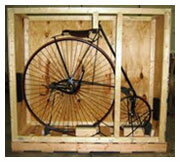 All of our crates can be custom fitted with Styrofoam to protect your cargo from rubbing against the wood. In this case add two inches to the inside dimensions for one inch of foam all around your item. In cases where your item has odd angles or voids, we can custom fit foam to protect your items and provide blocking to hold everything in place.